Moldova has a continental climate, with cold, snowy winters and warm summers. Since the prevailing currents come from the north or the west, the proximity of the Black Sea (which lies to the south-east) does not affect much the climate. The Republic of Moldova is a Romanian-speaking country, and has been a Soviet republic until 1991. Being a flat and small country, the climate is fairly homogeneous, with small differences; sometimes, however, it might snow in the north and not snow in the south. Here are the average temperatures of Chisinau, the capital, located in the center of the country. Precipitation in Moldova is not abundant, since it amounts to about 550 millimeters (21.5 inches) per year. The season in which precipitation is most frequent is winter, but given the low temperatures, it is not abundant, and occurs mostly in the form of light snow. The rainiest months in terms of quantity are June and July, mainly because of afternoon thunderstorms, but there are not more days with precipitation than in winter; in August, thunderstorms become less frequent. Here is the average precipitation in Chisinau. Winter in Moldova is cold, with an average temperature in January around -1.5 °C (29 °F). Sometimes, mild and moist air masses from the Mediterranean may raise the temperature above freezing (0 °C or 32 °F) and melt the snow, while cold air masses of Arctic or Russian origin can lower the temperature by many degrees, down to around -20 °C (-4 °F) or even below. Cold records are around -35 °C (-31 °F) in the north (see Balti, Soroca) and -30 °C (-22 °F) in Chisinau. Summer in Moldova is warm: in the two warmest months (July and August), the average minimum temperature is around 15/16 °C (59/61 °F) in the north and 16/17 °C (61/63 °F) in the center-south (so nights are usually pretty cool), while the maximum temperature is around 26 °C (79 °F) in the north, and 27/28 °C (81/82 °F) in the south. In the afternoon, thunderstorms may develop, especially in June and July. The sun frequently shines, in fact there are about 9/9.5 hours of sunshine per day from June to August. As mentioned, the temperature is normally acceptable, but sometimes there can be heat waves, capable of raising the temperature to around 35 °C (95 °F) and above, usually for a few days. 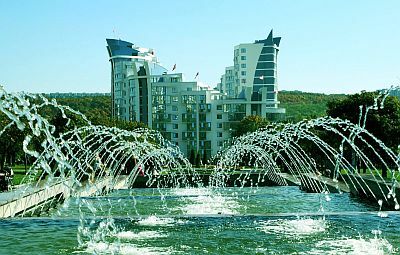 In Chisinau, the highest recorded temperature is 39 °C (102 °F). Sometimes in summer, floods can occur (as happened in July 2008 and 2010), mostly because of heavy rains which may occur in the Carpathian region and then swell the Dniester (or Nistru) River, which has its source in that mountain range, in Ukraine. The two intermediate seasons, spring and autumn, are quite short but pleasant: in May and September, the minimum and maximum temperatures are respectively around 12 and 22 °C (53.5 and 72 °F). In spring, the first mild or warm days can be followed by sudden drops in temperature, with possible snowfalls, especially in March and early April. In autumn, the first cold days occur in November, and sometimes in late October. The amount of sunshine is good in summer, while it's poor or mediocre from November to January, when gray skies predominate. You can go to Moldova preferably from May to September: usually, the temperatures are pleasant, with cool nights. In July and August, however, there may be hot periods, so if you do not like the heat, you can choose the months of May, June and September. In winter: bring warm clothes, such as a sweater or fleece, a down jacket, a hat, gloves and a scarf, a raincoat or umbrella. In summer: bring light clothes, a T-shirt, but also long pants, a light jacket and a sweater for the evening and cool days; a raincoat or umbrella.